Prologue: The Legend of Trinity is based on a secret war thought to have been fought between the Federation and a long-forgotten colony, right before the advent of the mobile suit known as the RX-0 Gundam Unicorn. While the Unicorn is named after a mythical horse with one horn, - hence, 'Uni', which in the ancient Earth language Latin, means 'one' - the heroic Unicorn MS has more sinister origins unknown to most., according to the Trinity legend. The 'uni' prefix denotes a 'unification' of three core mobile suits that preceded the Unicorn. Thus - three unifies into one. Which forms the backdrop of the Trinity saga. Anaheim was developing more powerful psycho-frame systems, still largely in infancy stages. Although peace reigned, an obscure Newtype Colony with origins related to the neutral Side 6, became curious of Anaheim's projects. They then stole the psycho-frame plans, as well as the blueprints of a prototype MS later came to be known as the MSN-06S Sinanju. Newtype scientists of the Colony cracked the psycho-frame technology and found that it yielded awesome power. They would harness it for self-defense. 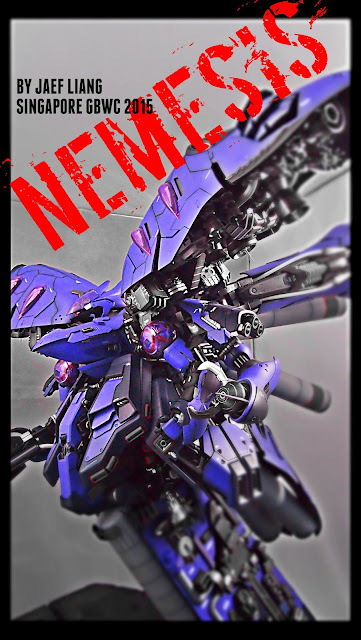 Three suits modeled after the Sinanju evolved from this endeavor - Niddhog, Tiamat and Bahamut. Together, they were codenamed Trinity. The Federation eventually discovered this, and deployed forces to deal with what was perceived as a legitimate threat to Earth. The more Fed intelligence found out about Trinity, the more they became paranoid of the immense power now lying in the hands of one minor Newtype colony. As diplomatic negotiations broke down, Earth sought to reclaim the stolen and improved technology by force. The resulting battle was one of the shortest and most contained, yet devastating war humanity has ever fought since the Amuro-Char era. It lasted only one month. Few got wind of it because covert forces were used by Earth, and battles were fought mainly on Colony territory. It was a watershed event in terms of mobile suit combat. Never before has mankind witnessed the full extent of the power from a psycho-frame enabled MS such as those from the Trinity trio. Each designed with different combat capabilities, they wielded unmatched weaponry coupled with the enhanced reflexes of Newtype pilots. According to battlefield folklore, Trinity took out an entire armada of Fed special ops forces more than triple that of the current Londo Bell unit - Four Ra Cailum class battleships, six Clop-class cruisers, and a 50-strong MS squadron. Another account claims that Trinity vanquished two prototype mega mobile-armours the likes of which have never been seen again. In the end, despite the might of Trinity, the Federation wins the war at a heavy cost by outlasting the withered Trinity pilots. Earth's reprisals against the Colony was ruthless. It's entire population was wiped out but its destruction, kept under wraps by an elaborate system of government cover-up. It was the most secretive genocide mankind has ever committed. Fearing that there will be political fallout should the public ever find out about the atrocities in the Trinity myth, all information and case files on the war, now known as the'Trinity Crisis', were clinically purged. All except the psycho-frame technology. The re-captured psycho-frame technology was incorporated into the blueprint of a new MS under development – The RX-0 Unicorn. It was found that by combining certain permutations of Trinity's systems into one cohesive mainframe, the issue of instability was resolved. From the ashes of Trinity, Unicorn was born. Except for the legacy of Trinity, no one remembers the name of the fallen Colony, sworn to secrecy and buried under layers of conspiracy. 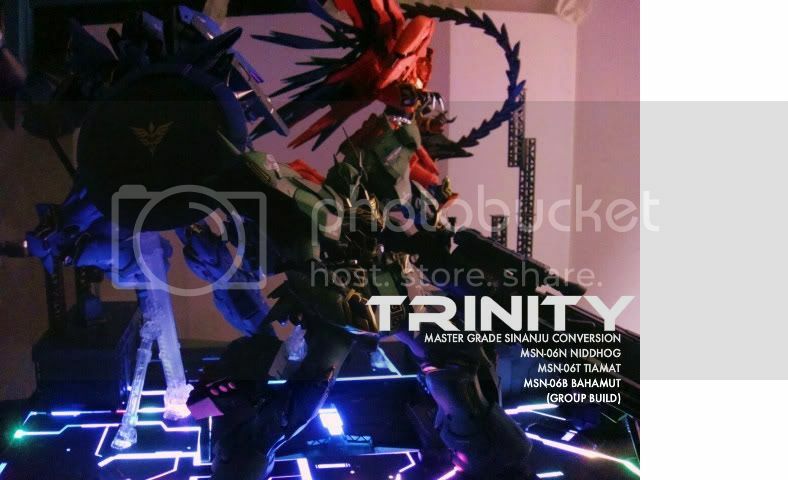 Some say that each of the Trinity MS was even more powerful than the eventual red Sinanju that Full Frontal came to pilot, and in fact, superior even to Unicorn. At its most extreme, even the mysterious and sinister Unicorn Banshee is said to have origins related to Trinity. Such unprecedented power cannot possibly be controlled, and hence, Trinity's short-lived existence. Others say the entire myth was just a fabrication by Neo-Zeon forces, propaganda to sway public support for Earth's government and throw mankind once more into the grip of war. No one really knows if Trinity ever existed, but its legend remains alive in the echoed whispers along hallways of top military officials and late night bunker chat amongst pilots….. While little is known about the Trinity Crisis, specific data on the legendary Trinity suits began surfacing in U.C. 0096, right about the time of the rise of Unicorn. These contain technical information thought to be the actual specs of the three mythical Trinity MS - Niddhog, Tiamat and Bahamut. Federation scientists have dismissed the files as fabricated information, as the weaponry purported far exceed anything that current MS technology can achieve. Believers however, are convinced that these are actual leaked information of Trinity's specs, proving that the myth was once reality. The purple MS, fastest of the three, is said to be the leader of the pack. Often deployed in close combat, Niddhog rarely utilised its beam sabre, opting instead, for its primary weapon, a devastating beam lance that could pierce through the thickest armoured hull of any Federation starship. Niddhog was supposedly responsible for the destruction of a majority of the Fed ships. It's stylistic design is said to be fashioned after medieval warriors of ancient Earth called knights. Because of this, it was also known as 'The Purple Knight' to enemy forces. Trinity's heavy artillery specialist was a green MS called upon to rain hell on the enemy even before being sighted. With its heavy armour, it was rumoured to be the most indestructible of the Trinity suits. Tiamat was peerless in long range combat, its mysterious particle beam cannon said to be connected to the MS's psycho-frame technology. No beam weapon of Earth's forces could match it in terms of accuracy and potency. It is not known how far Tiamat's awesome firepower can reach, but the cannon fired a beam that could stretch 100 metres in diameter, obliterating anything in its path. Said to be the most powerful and terrifying MS of Trinity, Bahamut was the harbinger of death for Fed pilots who witnessed it. No enemy who saw Bahamut apparently survived to tell the tale. Up till the final stand of Trinity, all accounts of this demonic suit were third-party rumours. Even though it was rarely sighted, the Bahamut left distinct wreckage in its wake – horrific lashes to ship hulls and MS armour, indicative of its deadly heat whip and fearsome claws. Because of its characteristic wings, the Bahamut was given the ominous nickname – 'Angel of Death'. Lighting Base - Manufactured in Singapore! I didn't get to see the detail of the base personally as the glass was there. Thanks for the photo now I can see the fine details. You use the pla-plate to do the base??? you are legend. actually all 3 of you are. this is simply amazing. epic. Totally friggin epic. The MSN-06B Bahamut is the first thing that caught my eye, really like the idea of orange Epyon look alike Sinanju with wings. You guys really made singapore proud. Thanks for letting us see such great art. 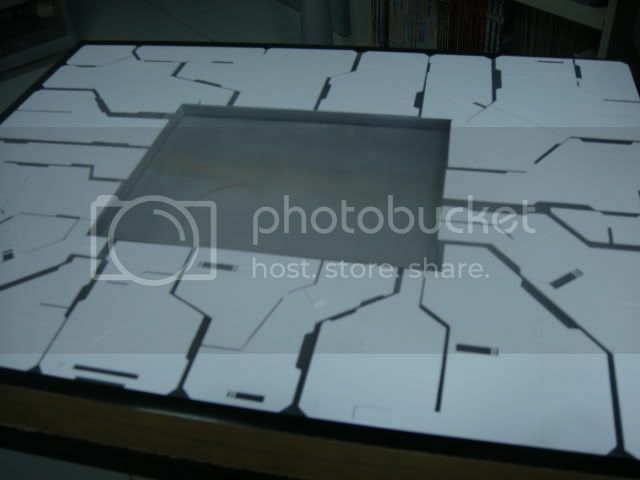 @gunpla, the groundwork was made entirely from pla-plates. AS for the structures, I used a few koto base parts to make. Amazing work Toymaker. This is so inspiring... every detail is professionally executed. hello! I'm the guy who represented Italy at Bakuc, thanks for your advice and your kindness! 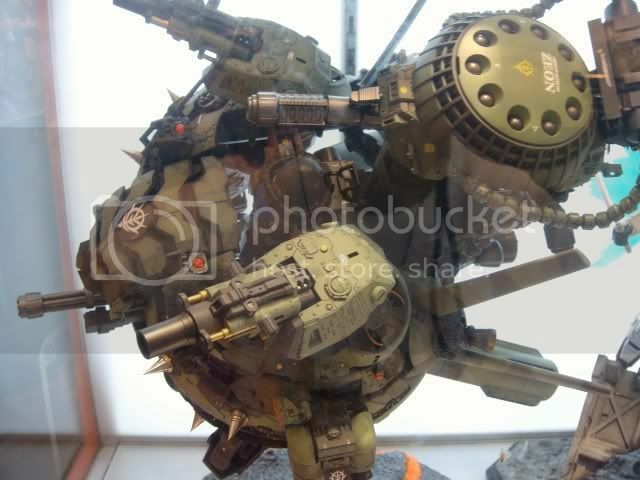 come and visit me on the forum of Mechanical Rage (collection of models and toys). My nickname is King. see you soon and congratulations for your work! Hi Kamm, I'm not too sure whether there is a group cat next year. Thanks for sharing the photos. Is amazing stuff that you guys have put in. I really like the base. It's absolutely fantastic! Great story, looks like a page torn from a log. Great job Yihui. I kindof knew that you did the orange one when I first say it, but was not sure. The knight is not just your style. Nywyas, awesome post and awesome work! love the idea of the background story and, how long did it take you to build all of them? well looking forward for more amazing gundams from the assembly line.awesome work dude! @exia0029, we took about three months to finish everything. And yes, I will work harder this year man! Former FFXI game master chiming in...wanna know how I know he playes FFXI LMAO.